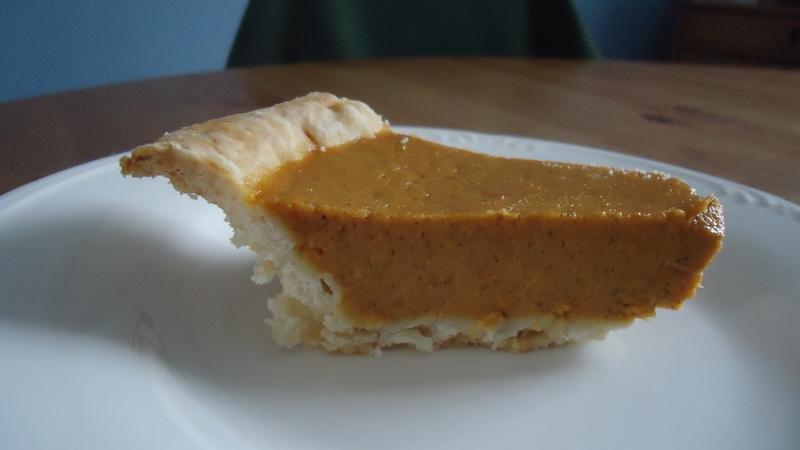 Why do we eat pumpkin pie at Thanksgiving, and not in the middle of July? Because once upon a time, long before supermarkets and canned pumpkin puree, people ate what was available to them in any given season, and pumpkins were available in the fall. Seasonal eating is another great lesson that can be learned from your local family farm market. Pumpkins, squashes, and apples are great fall foods, as peaches, berries, and corn sweeten the summer. Citrus fruits, like my favorite clementines, are at their best in winter. So while you can procure nearly any fruit or veggie year-round, it won’t necessarily taste as good out of season. You could certainly roast a pie pumpkin, scrape out its flesh, and use that in your pumpkin pie, but thanks to the good folks at Libby’s pumpkin puree is available year-round. This is a quick and easy recipe that works well for busy holiday times. Line a 9-inch pie dish with crust; trim edges and place on a rimmed baking sheet to catch any overflow. In a medium mixing bowl, combine pumpkin, sugar, cinnamon, ginger, and nutmeg and beat with a fork. Add eggs and beat lightly until combined. Slowly add milk and mix well. Pour filling into prepared pie dish. Cover the edge of the pie with a guard or foil to prevent over-browning. Bake for 25 minutes, then uncover the edge and bake another 25 minutes, until a toothpick inserted in the center of the pie comes out clean. *Full disclosure: In my flurry of Thanksgiving preparations, I totally forgot the additional 1/2 cup of milk in this pie. It turned out just fine, but next time, I’ll make sure to use both the evaporated milk and fresh milk! Several Thanksgivings ago, in our tiny kitchen in DC, I made sugar cut-outs in the shape of turkeys, pumpkins, maple leaves, and acorns. Rolling out sugar cookie dough in a galley-style kitchen is next to impossible, but the little dining table we had in our living room worked very well. 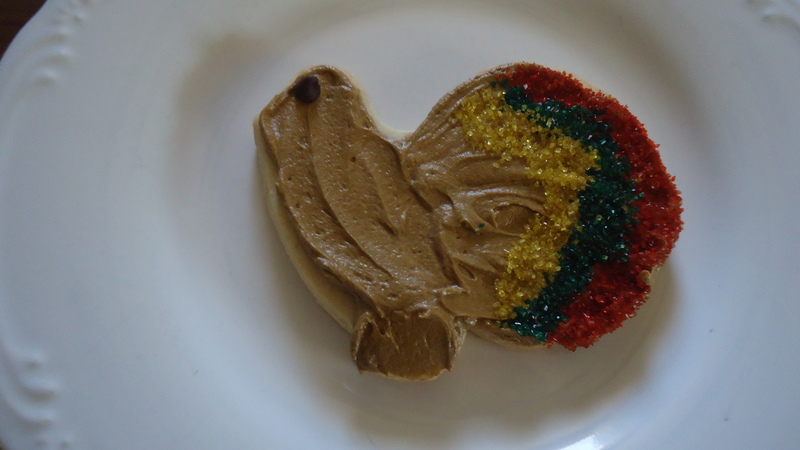 Decorating sugar cookies is a fun endeavor, and because I had colored sugar that year, I decided to embellish the turkeys so that both toms and hens were on the platter. When the cookies arrived at Aunt Liz’s house, they were a big hit. My cousin-in-law, Robb, first called the turkeys “anatomically correct,” but we later agreed that “gender specific” was a more appropriate term. Either way, I now make these turkeys every year. Bake and cool sugar cut-outs. Prepare icing; add enough brown food coloring to reach your desired turkey color. Frost turkeys with a small offset spatula or butter knife, using a swirling motion to make feather patterns. Press a miniature chocolate chip onto each turkey for the eye. For the toms: starting on the outside of the feather end, use a teaspoon to sprinkle on a generous amount of colored sugar; repeat with two additional colors. Gently press the sugar into the icing with your finger, then lift the cookie and shake off any excess. Allow icing to set before storing; store between sheets of parchment or waxed paper.